Easily transforming from a suitable from birth recliner highchair to a junior dining seat, the Cocoon Highchair from Oribel takes inspiration from the magical transformation of a butterfly and features an array of adjustable options to change the height, recline and position of the tray. Offering 4 distinct stages of use, the Cocoon highchair grows with your child and provides a multitude of practical features. Stage 1: Baby can recline and nap at an appropriate height whether you’re in the kitchen, relaxing in front of the telly or eating a meal at the dining table. Stage 2: Cocoon provides a supportive environment for baby to try their first tastes, offering the option of a tray for self-feeding or the bottle/food holder for parent lead weaning. 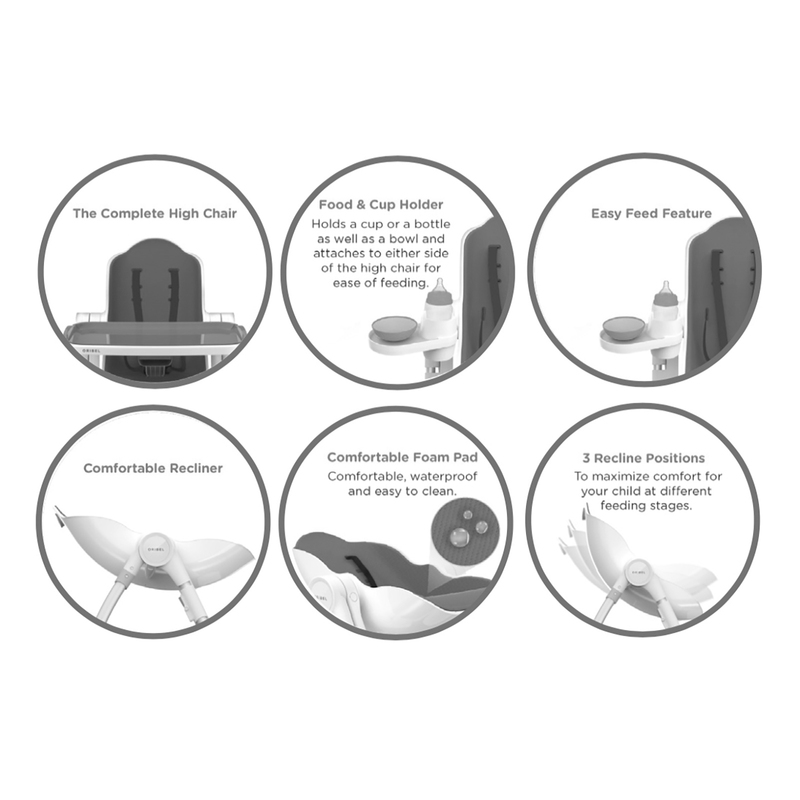 Stage 3: The Cocoon can be used as a traditional stand-alone highchair with removable tray for easy cleaning and access. Stage 4: In stage 4, the highchair can be used without the tray and set at an appropriate height to allow your child to join in at family mealtimes. The comfortable, removable foam seat is moulded in one piece making it easy to keep clean simply by wiping it down, whilst the magnetic tray enables it to be stowed easily on the back legs when not in use.